I stopped by Sunset Gondola today to pick up some things I'd left on the boat back on Monday, and couldn't resist taking a few photos. The gondolas looked great when they came out of the container six days ago, but they look fantastic now that the guys have spent some time with them. 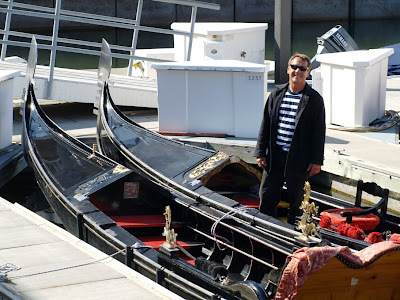 Tim smiles as only a gondolier who just got new boats can smile. Gondoliers Chris, Tyson Davis and Tim Reinard prepare the two new gondolas for the evening's fleet-cruise. Having these two gondolas next to each other offers a unique opportunity to compare the differences between two boats from two different gondola building yards - known as "squeri". A "squero" takes it's name from the Venetian boatbuilder's tool known by the same name; it's a type of measuring tool or builder's square. Each squero builds gondolas a little differently from the others, and to the untrained eye, they may all look fairly the same, but when you put them next to each other, their unique features become evident. Imagine if all German automakers produced their version of the classic Porsche 911. Or if each Italian automaker issued a car similar to the Maserati Quattroporte, but each one building it the way they thought it should be built. Now imagine that each Quattroporte, built by each automaker, was made-to-order based on the requests of the buyer. Now you get an idea of the uniqueness of each and every gondola built in Venice. These gondolas were built in Squero dei Rossi and Squero Tramontin. Tim and Tyson have already noticed a difference in the thickness of the stern, or "poppa". On launch day we all noticed that the height of the poppa was a little different between the two gondolas. 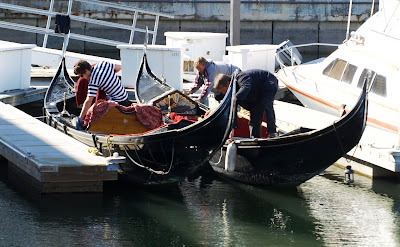 No doubt, the gondoliers will discover other differences between the boats for years to come. Two tails from two different squeri. This evening, the place was humming with activity, with gondoliers and passengers showing up and preparing for the fleet-cruise. Tim, Tyson, Joanna, and the rest of the staff now enjoy the ability to take out more than twice as many passengers at a time. I got to meet John Synco and his girlfriend Trish for the first time, along with a number of great folk, preparing to either be passengers or rowers.